Myself mohammed completed my graduation from acharya nagarjuna university. 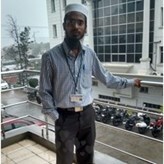 and doing Mba parallelly doing job in Tata Business Support services as an collection executive. I am now a semi qualified cost accountant with all India 44 th rank june 2015. Inshaaallah i decided to lead my life to help the people in need. People notice me about these things having beard. I am kindly towards every one and ready to take any challenges in my life very hard working in nature. I have lot patience to face the worse things taken in my life. The partner looking for should be religious and have education in quran. She should be loving and caring for all people. She should be caring and kind towards the poor. She should not back bite of others and honest.